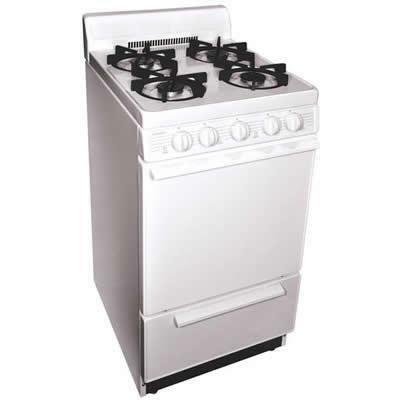 Premier 20 inches gas range with 4 inches porcelain backguard. Easy access, roll-out drop door broiler with smokeless, porcelain 2-piece pan &tray. Fully insulated oven saves energy & provides better baking results. Additional Information Two heavy-duty oven racks with four adjustable positions; Easy access, roll-out drop door Broiler with Smokeless, porcelain 2-piece pan &tray. Additional Dimensions Exterior width 20 inches.